Taylor McQuillin led Mission Viejo (California) High to a No. 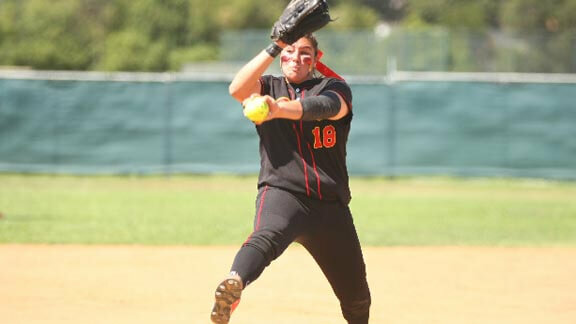 1 final national ranking and was named the 2014 Gatorade National Softball Player of the Year. Photo by Patrick Takkinen. 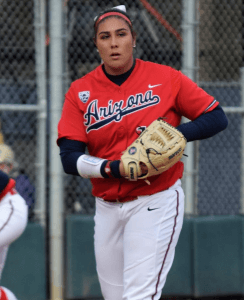 Five years ago at this time, current Arizona Wildcat pitcher Taylor McQuillin was starting her junior year that would see her go on to lead Mission Viejo (Calif.) High to a No. 1 national ranking as she went 25-1 with a 0.69 ERA and 316 strikeouts in 173 2/3rd innings. 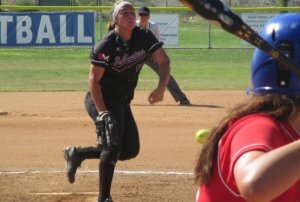 The Diablo standout pitcher would later be named the Gatorade National Player of the Year that year and would ultimately finish 55-2 in her last two years of high school ball in the very competitive Southern California CIF Div. II Section. As a junior, Taylor McQuillin led the nation with 15 shutouts. Photo: Wildcats Softball. Heading into this, her senior college season, Taylor has been named to the Top 50 Watchlist for the USA Softball Collegiate Player of the Year after a junior campaign that saw her go 28-12 with 15 shutouts to lead the nation and 287 K’s--11th best in the country--as she was named 1st Team All-Pac-12 Conference and All-Region. On March 24, 2014 she sent this blog to our Brentt Eads about what she thinks of pitching in high pressure situations… apparently, based on her high school, club (she won a PGF Nationals with the OC Batbusters) and college results, whatever she’s doing has been working very well! Our high-school team has recently played in two really big tournaments these past three weekends that have some of the best competition around. We were excited about how well we did and all of the accomplishments that we have achieved but we still know that the season is far from over. With two big championship games wins, we are even more motivated now than ever before! Taylor won high school and club national titles. Here she's seen pitching for the OC Batbusters. The competition we have faced is extremely high and for some people the high level of competition can put on a lot of pressure. How you handle it is what is important. For our team, handling pressure means relaxing and taking everything in with clear eyes. Go out there and play the game that you know how to play and just breathe. Every second of the game, you have to be focused--whether it is mentally or physically. The big game focus raises the level in which the two teams will compete because the game becomes that much more challenging when both teams play to their full potentials. In situations like championship games or even games in tournaments that you need to win to move on to get to the championship game, the pressure will continue to rise. The key is staying calm in these situations because it is important to remind yourself that you are capable of playing in them with your team. When I am playing in major games with my team, whether it is high school or travel ball, I remind myself that my team is behind me defending me and playing their game for me and the rest of the team. It keeps me calm and motivates me to play for them. No matter what, relax and play your game and that way, the only thing that can beat you in the end is yourself.